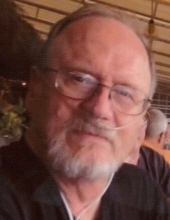 Richard L. Albertson, 67, of Moline passed away July 22, 2016 at Unity Point Rock Island. Per his wishes, his body was donated to Gift of Hope, so others may live through him. Cremation rites will be accorded and a celebration of life will be held at a later date. Quad Cities Cremation Center is assisting the family with arrangements. Richard was born Sept. 21, 1948 in Rock Island the son of Leland and Katie Albertson. He was a disabled vet serving in the Navy. He married Marla Albertson in 1974. Richard worked as a machinist at the Rock Island Arsenal for 36 years retiring in 2013. He was a member of the Geneseo Moose Lodge. Richard enjoyed time with his grandchildren and playing guitar and fishing. Survivors include his wife, parents, children Erin (Alan) Randall, Kelly (John) Banik, Michelle (Darwin) Ward and Rick Albertson; 13 grandchildren; 4 great grandchildren and a brother Lee Albertson Jr.
To plant a tree in memory of Richard L Albertson, please visit our Tribute Store. "Email Address" would like to share the life celebration of Richard L Albertson. Click on the "link" to go to share a favorite memory or leave a condolence message for the family.